What do people feel is more important to liveability, a good public transport service or a good road network? How do people rate their transport systems? And do people derive liveability from extensive motorway networks? The Property Council of Australia recently commissioned some polling about the liveability of Australian cities. It looked at 17 attributes of a city including public transport and road network performance. With the data available, I aim to shed some light on those questions. The survey was conducted in September/October 2010, and included around 600 respondents in a representative sample from the major cities (except Perth which was a sample of only 318 for some reason, which will increase the margin of error). In my analysis I’ve left out the very small cities of Hobart and Darwin. Sorry guys, but you are both smaller than the Gold Coast, the Sunshine Coast, Newcastle, and Wollongong – which weren’t included in the survey. In fact, the Gold Coast and Newcastle are bigger than Canberra, so maybe I should have left Canberra out too. More info about the survey here. 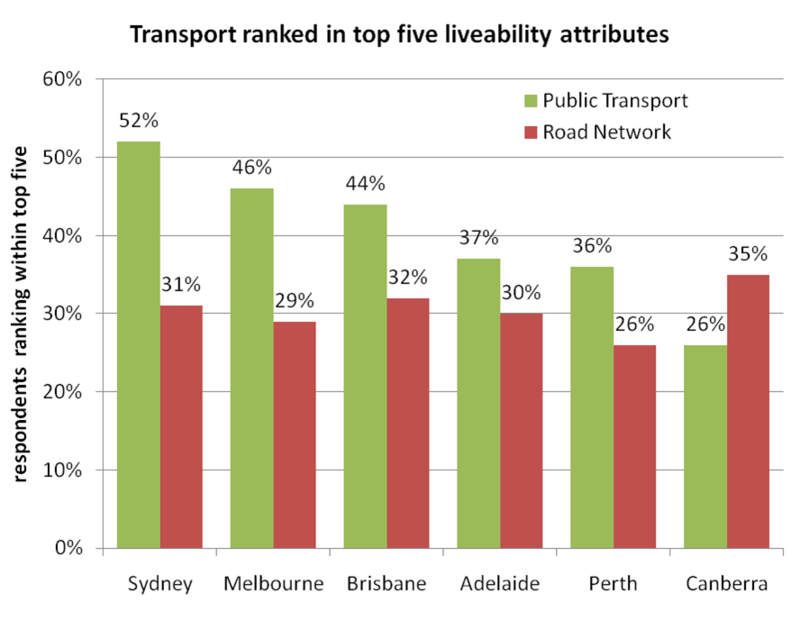 What’s more important to liveability – a good public transport service or a good road network? Importance data was gathered by asking respondents to rank each of the 17 attributes in order of importance. Public transport was highly important for liveability for a significant portion of respondents in all cities, but more so in larger cities. 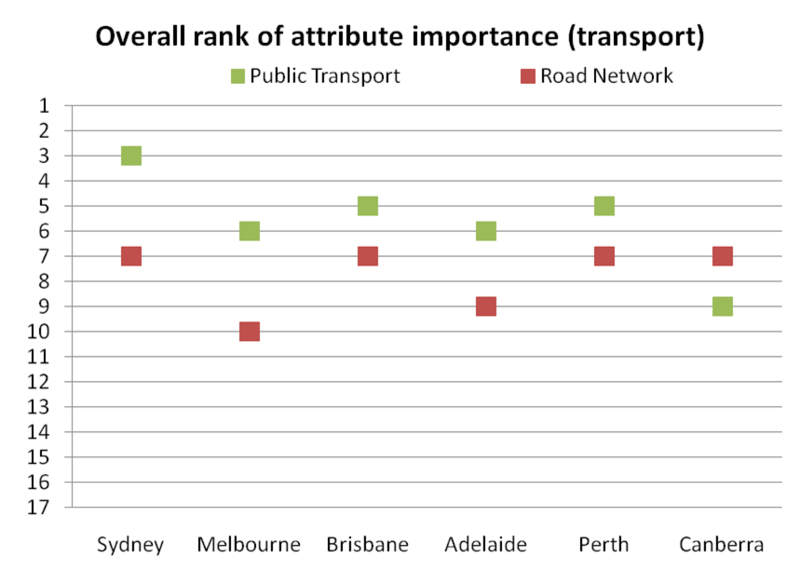 A good public transport service out-rated a good road network as highly important for liveability in all cities except Canberra. Is this because people in Canberra don’t see a congestion issue that needs to be tackled with public transport? Public transport ranked highly in all cities (except Canberra), and was 3rd top in Sydney. A good road network came 7th in all cities except Melbourne and Adelaide where it was slightly lower. 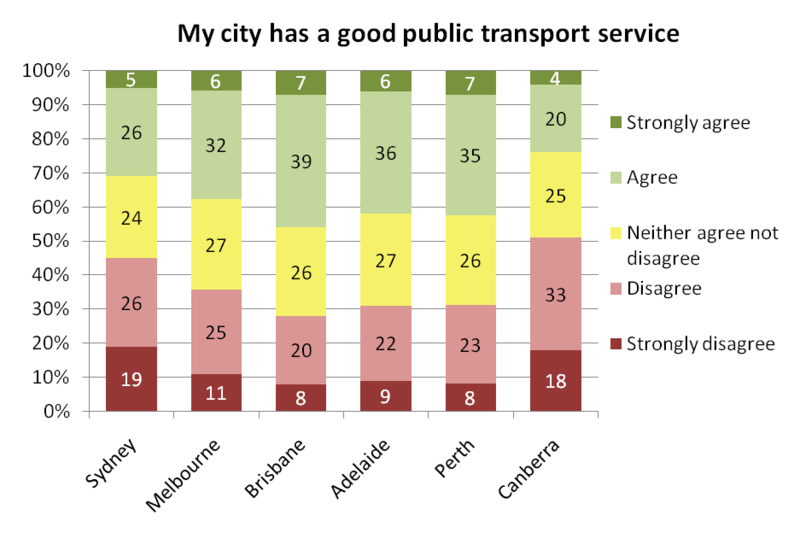 Suffice it to say, most respondents in large cities thought having a good public transport service was more important to their city’s liveability than having a good road network with minimal traffic congestion (with the exception of the smaller city of Canberra). Indeed many commentators think congestion is a good thing, but I doubt many members of public would agree. How do the cities rate on public transport? Firstly, did people in each city agree or disagree that their city had a good public transport network? Brisbane had the highest proportion of respondents agreeing their city had a good public transport network, with Melbourne, Brisbane, Adelaide and Perth not far behind. Respondents in Sydney and Canberra had the highest rate of disagreement. While around half of respondents in Sydney and Melbourne ranked public transport as very important, a significantly smaller portion agreed their cities had a good public transport service, suggesting a high level of dissatisfaction. Fewer Canberra respondents thought public transport was important or thought Canberra had a good public transport service. Again not surprising considering Canberra has a road network that probably meets passenger transport needs quite well. I should say that just because more people agree that their city has a good public transport service than those who rank it as one of their top 5 attributes, doesn’t mean the public transport service exceeds their expectations for a liveable city. How do the cities rate on road networks? A majority of respondents in Sydney disagreed that it has a good road network, even though Sydney has embarked on many major motorway building projects in recent years. So, is the answer to build more/wider motorways (which arguably just induce more traffic), or perhaps tackle the transport challenges in a way that reduces overall traffic? The results of this survey suggest having a good public transport service is seen as more important for liveability in Sydney (and all the other large cities). 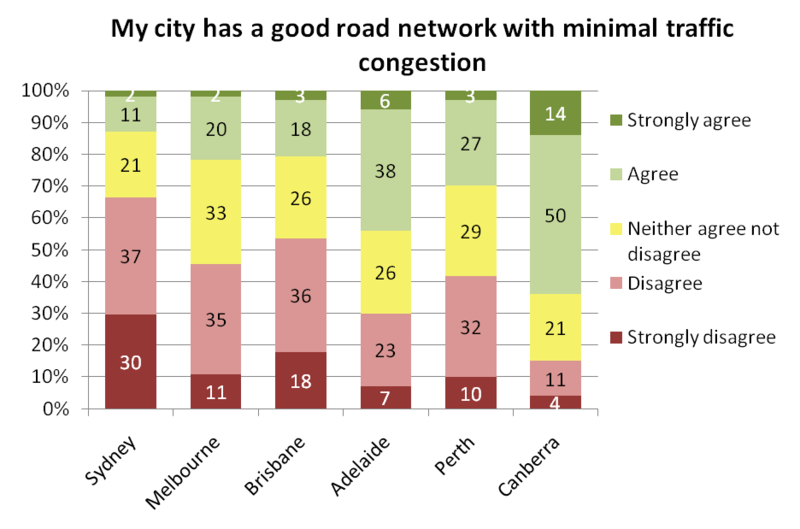 Perth, Melbourne and Brisbane also have considerable freeway/motorway networks, but only a minority of respondents think their cities have good road networks. 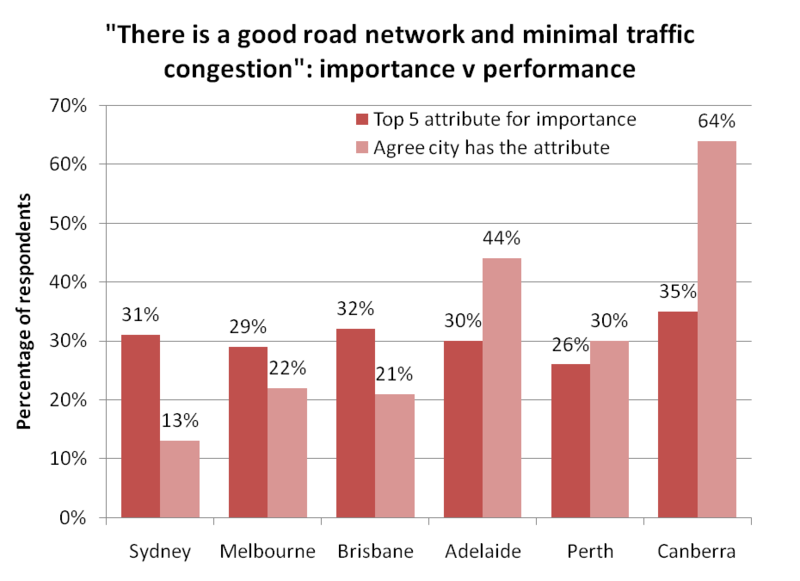 Respondents in Canberra and Adelaide were more likely to agree that their city had a good road network. Canberra isn’t a surprise, but Adelaide is interesting: it is the only major city in Australia without an extensive freeway network, and yet more respondents were content with their road network, and the city was ranked most liveable overall. People in Sydney appear to be most dissatisfied with their road network, while people in the relatively smaller cities of Adelaide, Perth and Canberra had higher levels of satisfaction. For comparisons between cities on all 17 attributes, have a look at this presentation. This entry was posted on Wednesday, January 26th, 2011 at 6:09 pm and is filed under Australian Cities, Liveability. You can follow any responses to this entry through the RSS 2.0 feed. You can leave a response, or trackback from your own site. A very limited view of livability and transport. Walkability and the freedom to bike ride safely are considerable components of liveability. You only need to look through the dire health statistics for Victoria to realise how limited a view research provides. More obese people than healthy people by 2025, what a horror, our poor community.